On December 12, 2018, ComiXology Originals releases Elephantmen 2261: Holiday Special, the first ever Elephantmen holiday issue by the long time creative team of writer/letterer Richard Starkings, artist/colorist Axel Medellin, a stunning cover by Boo Cook, and a holiday backup story by Richard Starkings and Superfreaks artist Margaux Saltel. But that’s not all. 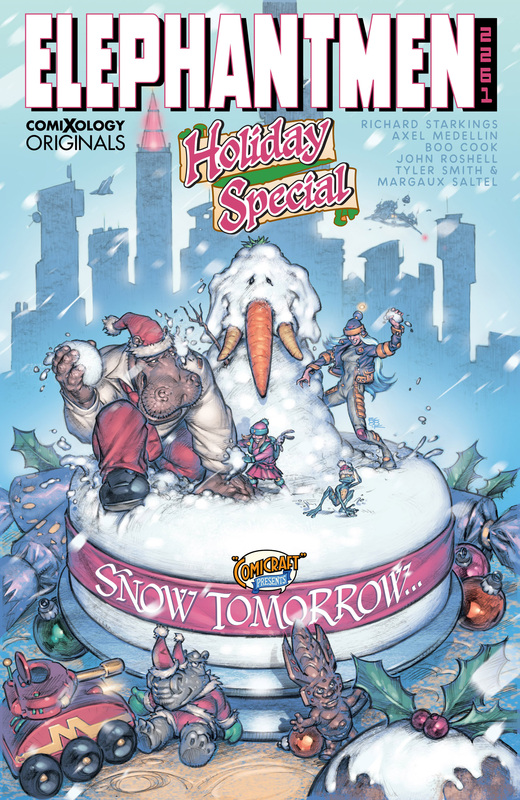 This stand-alone one-shot includes a special holiday short story outside of the Elephantmen universe written by Richard Starkings with art by Margaux Saltel (Superfreaks) titled, MARZIPAN! about a little alien who meets a little girl. Girl falls in love with little alien. Alien falls in love with Marzipan. Little girl loses little alien! Not familiar with Elephantmen? Elephantmen are human/animal hybrids designed to fight a war. But the war is over, and now they live among us. Debuting nearly 15 years and 80 issues ago from Image Comics, comiXology recently released the 5-issue who dunnit miniseries Elephantmen 2261: The Death of Shorty as part of the comiXology Originals line of exclusive digital content. Both Elephantmen 2261: The Death of Shorty #1-5 and Elephantmen 2261: Holiday Special are included in Prime Reading, Kindle Unlimited and comiXology Unlimited at no additional cost and available for purchase only on comiXology and Kindle. Richard Starkings is also the creator/writer of Ask for Mercy; and co-creator of The Beef with Tyler Shainline and Shaky Kane. In the course of a distinguished career in comic books, Richard edited for Marvel UK in the 80s and founded the lettering studio Comicraft in the 90s. He has worked as a lettering artist on just about every comic book you might care to mention, including Batman: The Killing Joke, and has written for The Real Ghostbusters, Zoids, Transformers and Doctor Who. Boo Cook studied at art college in Cambridge. In the year 2000 AD he approached the British comics weekly 2000 AD and was soon drawing Judge Dredd, Judge Anderson, ABC Warriors, Harry Kipling, Asylum and Blunt for the Judge Dredd Megazine. Boo has illustrated for Titans’ Doctor Who and created covers for Marvel including Wolverine. Boo is a talented musician and performs with his bands, Forktail and Motherbox. ComiXology, an Amazon.com, Inc. subsidiary (NASDAQ:AMZN), is a cloud-based digital comics service. With content from over 125 publishers and thousands of independent creators from around the world, comiXology provides a diverselibrary of comic books, graphic novels, manga and bandes dessinées. The company’s first-in-class innovations include Guided View technology, which provides an immersive and cinematic reading experience, and a monthly subscription service. ComiXology is based in New York City, with operations in Seattle and Los Angeles. For more information, visit comixology.com and follow the company on Twitter, Facebook and Tumblr.